East Coast amateur astronomers have been gearing up for NEAF all Winter long (see our original announcement HERE). One of the special extra NEAF events, now in its 10th year, is the NEAF Solar Star Party (NSSP), featuring several solar-safe scopes, many well-versed solar observers, and hopefully an active solar surface as we approach solarmax. 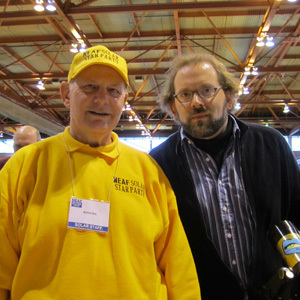 The host of the NSSP is none other than Barlow Bob (the brightly lit one pictured at right with the author at NEAF 2011), a solar-centric observer who has graced several CNY locations in the past few years both with truly remarkable views of our nearest star and his great knowledge of optics, light properties, and the Sun itself. Provided the skies are at all reasonable, you can be guaranteed of some excellent views of prominences and sunspots. wavelengths, through a variety of solar filters and spectroscopes. Join us, for two days of solar observing at NEAF 2013. No star party entrance fee, or registration required.